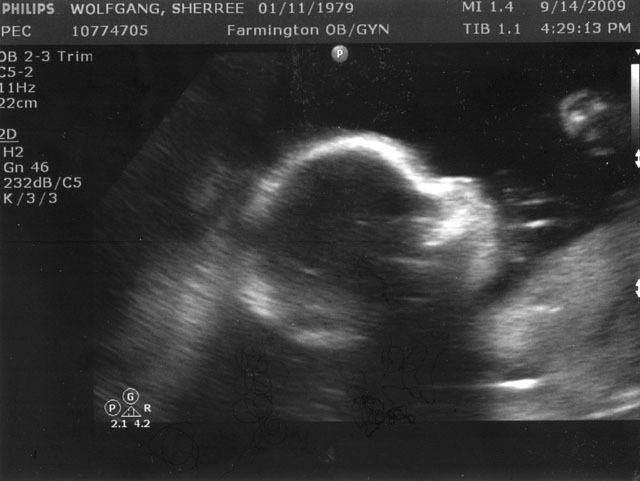 During my 19 week ultrasounds, baby twisted and turned, and was generally VERY uncooperative with my sonogram tech. So, I was rescheduled at my next appointment for additional ultrasounds attempting to scan for spina bifida, cleft lip, and GI abnormalities, as well as verify that the cord insertion was ok. Baby laid pretty still this time (it was a long day at school, so I’m sure he or she was as tired as me). Baby was so still that the tech tried several times to roll him or her over and there was only one successful peak at the back. Either this kid is wicked stubborn or just a heavy sleeper like me…. let’s hope for the latter!